The Home Energy Report 2017 gives you more information about your energy use, so that you can make informed choices and control your energy bills. What is Home Energy Report (HER)? It’s not a new bill! Educate customers on energy usage and saving, so customers can make informed choices and control energy bills. HER Pilot Program ran from July 2015 to June 2016. Report received via print and email in English as default language. Total of 13,979 megawatt hours of electricity saved. Approximately RM5,386,000 in customer bill saving. Equal to 1,500 cars removed from the road for a year. Program runs from Oct 2017 to Sept 2018. Report received in Bahasa Melayu as default language. 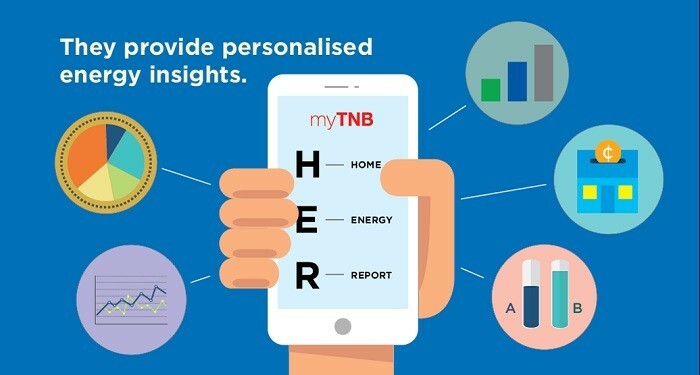 The rest of 6.5 Million customers can ONLY access HER embedded widgets in myTNB portal. Expansion Phase 2 or HER 2017 New Recipient Customers Selection Criteria. As it is an RCT, 100,000 customers (50,000 customers per track) were selected as the control group. Similar Home: Comparison graph on customer compared to other similar homes based on specific characteristic. Take a survey on their energy consumption at home. Get a specific analysis based on the survey they answered that will be highlighting specific categories involved. Personalized and in-depth tips to help them to save more energy on the specific appliances or item. 1. What is the purpose of the programme? The purpose of programme is to provide more information about your energy use so you can make informed choices and save money. 2. How was I selected to be a part of this programme? 3. Why are you trying to make me feel bad? Not at all. Rather, we hope that the information we provide can offer valuable insights and context about your home’s energy use so that you can take better control of your energy use. 4. Can I opt out of this programme? 1. Do monthly billing and usage amounts include tariff rebates or GST? No, monthly billing and usage amount are the amounts and not the final charges with tariff rebates or GST included. 2. How do you know this comparison is valid or accurate? 3. The information about my home is incorrect, how do I update it? 4. Who are my similar homes? Your energy use is being compared to the usage patterns of a group of about 100 similar homes whose homes are close to yours and similar in size. 5. Where does this data come from? The data on the reports comes directly from your meter reads, but if you feel that the data is incorrect, please call us at 1-300-88-5454 or email to [email protected] for further assistance. 6. How does the similar homes comparison work? 7. Where can I learn more about these similar homes? Let’s login to the web portal. Under the similar homes comparison bar graph is a link that says “What homes are compared?” This link will provide you with more insight into who you are being compared to. 8. I have special circumstances and don’t feel that the reports apply to me. Special circumstances could definitely affect your comparison but we feel that there are other parts of the report that you will still find it useful like tips for example that will give you various ways for you to start saving now. 9. I have certain life or housing circumstances, such as energy-intensive medical equipment, that prevent me from reducing my energy use. So how can this web portal help me? It's understandable that some people may have life or housing circumstances that make it difficult to reduce their home's energy use. We aim to provide a wide range of ideas that can address the various needs of our customers and their homes. We encourage you to find out which energy efficiency (EE) tips are best for you and search for more ideas. In some cases, you may not be able to realize substantial savings, but we've found that most people can realize at least some savings and we hope we can help you do so. 10. How can my efficient similar homes manage to use so much less energy than me? Efficient households likely take a variety of steps to reduce their electricity use. For more useful tips go to Home Energy Tool and click on Energy Saving Tips at www.myTNB.com.my. 11. How do you determine the size of my home and how do I update it? The size of your home is based on data that is collected from public records. If the size of your home is not correct, you can change it in the ”Manage My Account" section of this Home Energy Report web portal.